In April 1996, researchers from the Western Australian Museum explored marine sediments of mid-Cretaceous age (about 95 million years old) for vertebrate remains in the Giralia Range, east of Coral Bay. After a long and rather unproductive day of fossil collecting they came across some very large fossil vertebrae of a shark. When the researchers began to excavate the site they also found about 70 teeth from the shark. The excavation came to an abrupt end as Tropical Cyclone Olivia rapidly approached the site from the north. A second expedition to the site was carried out the following year, resulting in the finding of an additional 30 teeth from the shark. 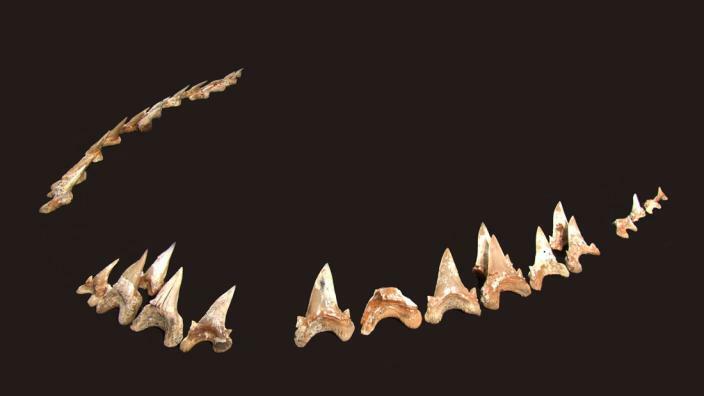 In general, the vast majority of fossilised remains from sharks comprise shed, isolated teeth. Sharks continuously replace their teeth with slightly larger ones as they grow and can therefore produce large numbers of teeth during their life span. Associations of teeth and skeletal remains, such as calcified vertebral centra, are very rare finds. The associated teeth and vertebrae from the Giralia Range turned out to represent an entirely new family of sharks, the Cardabiodontidae. Cardabiodon ricki is the largest known shark species in the world of mid-Cretaceous age with large individuals reaching an estimated 7 metres in length (larger than the largest known white shark).